In recent years, Georgia has adopted many modern traditions: new dishes on the festive table, celebrations in a restaurant or a club instead of traditionally family dinner… But some things remain the same always, and if you decide to spend the New Year holidays here, you will surely spot them! First of all, there special symbols in festive decoration here. Even if you walk through the main streets and avenues of Tbilisi during the holidays, you will notice that the lights in the city feature symbolic images: figures of angels, the star of Bethlehem, palm branches which symbolize peace. Not just in the capital, but especially in the regions there is also a traditional New Year tree not a fir or pine, but chichilaki. This curly decoration comes from Guria region and symbolizes St. Basil’s beard, whose name day falls on January 1st. People carve chichilaki from a branch of walnut. It should be dried for 2-3 days, then the skin is carefully removed and shavings are made. Some families decorate chichilaki with some toys or candies, some put it next to fruits and sweets, so that the coming year will be sweet and successful. At the end of the holidays – usually on January 19 – chichilaki is brought to the wine cellar until next year, or is burnt, so that all possible hardships also turn into ashes. Immediately after the New Year midnight, mekvle arrives to every home. Usually it is a family friend or acquaintance who has a “lucky foot” and brings good luck and happiness. Mekvle also comes with sweets and good wishes, prosperity and peace for the whole family. And of course, New Year’s table in Georgia is just overloaded with traditional food and drinks! 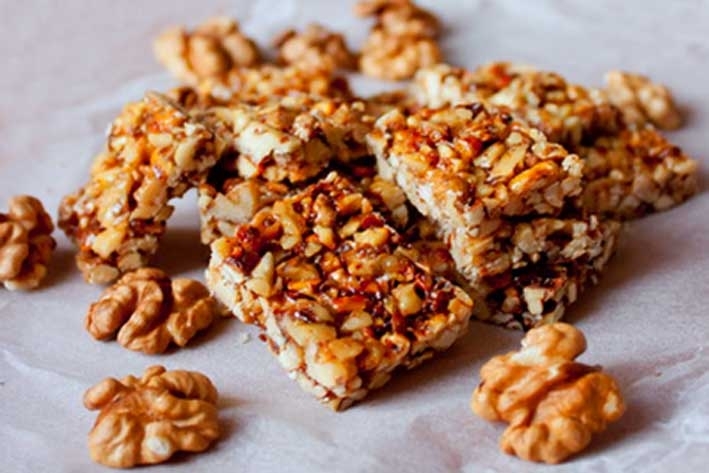 By the way, there are also traditional festive sweets in Georgia – churchkhela (walnuts in grape juice), dried fruits, nuts and gozinaki – nuts covered with honey. People enjoy them during all holidays, but it is worth remembering that it is necessary to eat a slice of gozinaki on the morning of January 1 – again, to make year sweeter. January 2 is also an important day (not just for those who drank too much Georgian wine during festivities!). This day in Georgia is called “bedoba” – the day of good luck. The way you spend this day is influencing the whole year! So if you find yourself in Georgia on January 2, try to make the day full of fun, positive emotions and culinary delights (which is possible here!). Then be sure: the year will continue in the best possible way!